In an effort to bring home a victory for the four rings this year at Le Mans, Audi is not only submitting the R15 TDI to further technological development, but also adding three new drivers to the Audi Sport team. Meet Marcel Fässler, André Lotterer and Benoît Treluyer. Full press release after the jump! INGOLSTADT, Germany, Jan 28, 2010 - Audi Sport leaves nothing to chance in its endeavor to bring the prestigious Le Mans trophy back to Ingolstadt and Neckarsulm. Not only the technology of the Audi R15 TDI is being subjected to further development. The drivers’ line-up for the 24 Hours of Le Mans (France) has been extended as well. 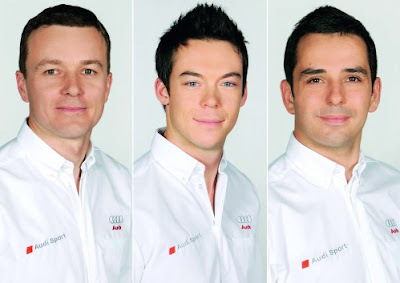 For the world’s most famous endurance race, Audi has signed three new drivers, the Swiss Marcel Fässler (33), German André Lotterer (28) and Frenchman Benoît Treluyer (33), who will be sharing the cockpit of one of three Audi R15 TDI cars on June 12/13, 2010. The new Audi drivers already have experience at the wheel of diesel racing sports cars. Marcel Fässler successfully contested two races in the American Le Mans Series for Audi in 2008. André Lotterer impressed at Le Mans last year at the wheel of an Audi R10 TDI of the private Audi customer team Kolles. Benoît Treluyer competed in the 24-hour classic in a Peugeot in 2009. Marcel Fässler, André Lotterer and Benoît Treluyer have already visited Audi Sport in Ingolstadt for seat-fittings and will soon be testing the Audi R15 TDI. The first racing commitment for the new Audi driver trio is planned for May 9, in the 1000-kilometer race at Spa-Francorchamps (Belgium), which will serve as a dress rehearsal for the 24 Hours of Le Mans for Audi Sport Team Joest. Audi has been contesting the 24 Hours of Le Mans since 1999 and having made 11 starts, has won the race as many as eight times. In addition to speed, reliability and efficiency are the key factors of success in the world’s most famous endurance race. Furthermore, the LMP1 class is unrivaled by any other motorsport category in terms of offering the opportunity to test technical innovations in racing conditions. Thanks to its technology leadership, Audi has repeatedly set milestones in this regard. The Audi R8, for instance, successfully introduced TFSI gasoline direct injection technology in 2001, while in 2006 the Audi R10 TDI was the first diesel-powered vehicle to clinch victory in the history of the race.